Achieve peak performance and look your best with this detailed nutrition plan. If you’ve always wanted to hit the stage in a bikini or figure competition, this is your time. Our comprehensive plan includes the Workout Plan, this nutrition plan, and motivational tips to help you get a winning physique in just 12 weeks. Give it a try—even if you’re not ready for the spotlight, you’re guaranteed to get into the very best shape of your life. How it works: This nutrition program is designed to help you drop fat without losing muscle. In each phase, you’ll have three daily meals and three snacks. After every four weeks, you’ll reduce the number of calories in your diet, without sacrificing protein. In the week before the show, you’ll vary the amount of carbs, sodium, and fluids to help your muscles get that ultra-cut, superlean look just in time for your moment in the spotlight. 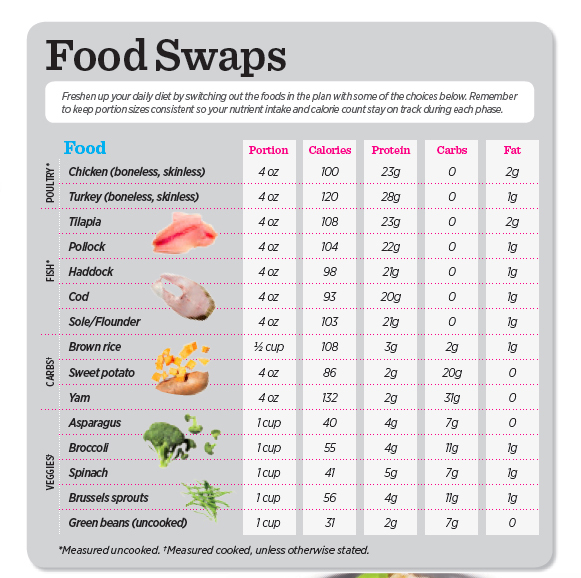 Follow the meal plan outlined here, which also includes a Food Swaps guide below. In addition, try to consume at least one gallon (16 cups) of water a day. And a limited amount of sodium helps regulate body fluids, so don’t be afraid to use low-calorie condiments like mustard and hot sauce.